Thanksgiving is my favorite holiday. I go home to Memphis, Tennessee, and my family spends the day eating, playing each other funk music (Curtis Mayfield, the Revivalists, and the Tedeschi Trucks band are some of our favorites), and pretending to care about the Detroit Lions game for the sake of my uncle’s girlfriend. Like many others, we go around the table and say what we’re grateful for, but we can take this so much further to create a more meaningful experience. So far, there are 35 MHWOW “Friendsgiving” programs happening next week, and counting! If you don’t celebrate Thanksgiving, you can still create programs centered around gratitude. Here’s a discussion guide followed by a list of interactive activities you can do at your Friendsgiving programs this year! How does Judaism define gratitude? The Hebrew term for gratitude is hakarat hatov, which means “recognizing the good.” Practicing gratitude means recognizing the good that is already yours. Gratitude is one of the most important Jewish values. The first words the Torah mandates we say each morning, Modeh/Modah ani, means “I thank you.” Throughout the day there are so many prayers we say to give thanks for the human body, the physical world, you name it. Even our name is rooted in gratitude. The matriarch Leah named her fourth child Yehudah, which means “I am grateful.” Yehudah is the source of the name of the Jewish people: Yehudim. Discuss: Why is gratitude important to you? What are the benefits of acknowledging the good things in your life? Being grateful helps cultivate happiness! Research confirms that those with high scores on measures of gratitude also score high on measures of happiness. In one study, 95% of individuals describe feeling happy when expressing gratitude. Discuss: Do you find that it is difficult to be grateful for what you have? What gets in the way of gratitude? Discuss: How do you cultivate gratitude in your life? What would make it easier to acknowledge the good things in your life? So how do you practice? For me, I’ve found that practicing mindfulness helps me to be grateful. One of the tenets of mindfulness is grounding ourselves in our breath. The Sages noted the similarity between the Hebrew word for soul, neshamah, and the word for breath, Neshimah, in this verse: “Let all souls praise God, that man should praise and thank the Almighty for every breath.” I’m hoping they didn’t mean literally every breath, but the mandate is clear. This is one of my best friend’s family traditions. Each person takes some time to reflect and write what they’re grateful for on a “feather,” then we read our reflections out loud and hang the display on the wall. 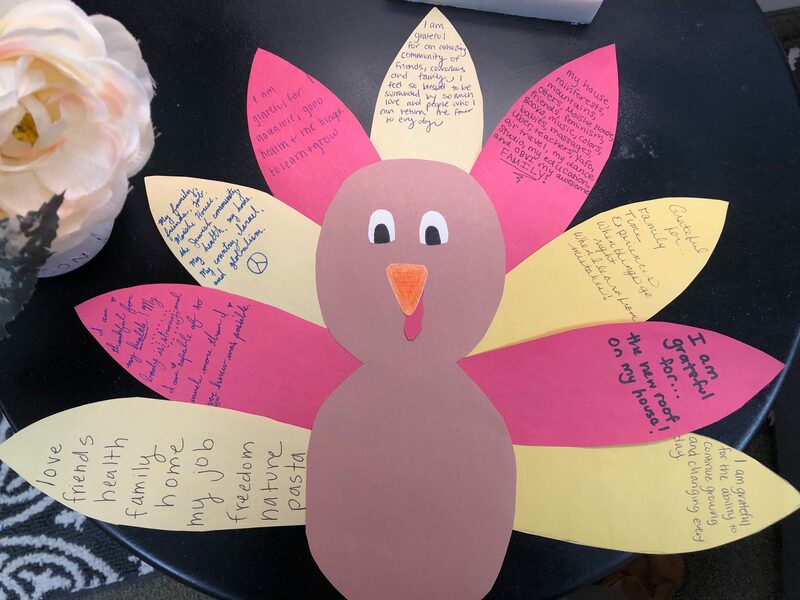 You can even take a picture and send it to your participants in a few months, inspiring them to keep practicing gratitude every day, not just on Thanksgiving. Pass out paper to each of your participants and ask them to create a list of 20 things they are grateful for. 20 may seem like a lot, but hopefully this will demonstrate how much we have to be grateful for! Ask participants to share one thing they wrote down, and suggest they take their lists home as a reminder of all the good things in their life. 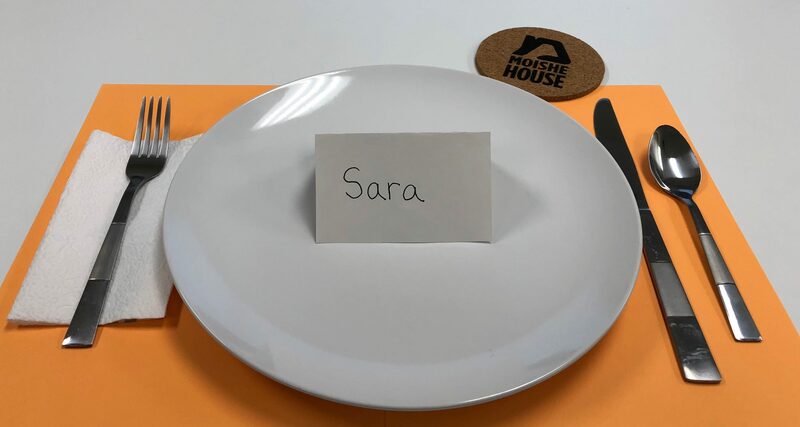 If you’re assigning seats at your table with folded paper place settings, write each person a note on the inside about why you’re grateful for them. 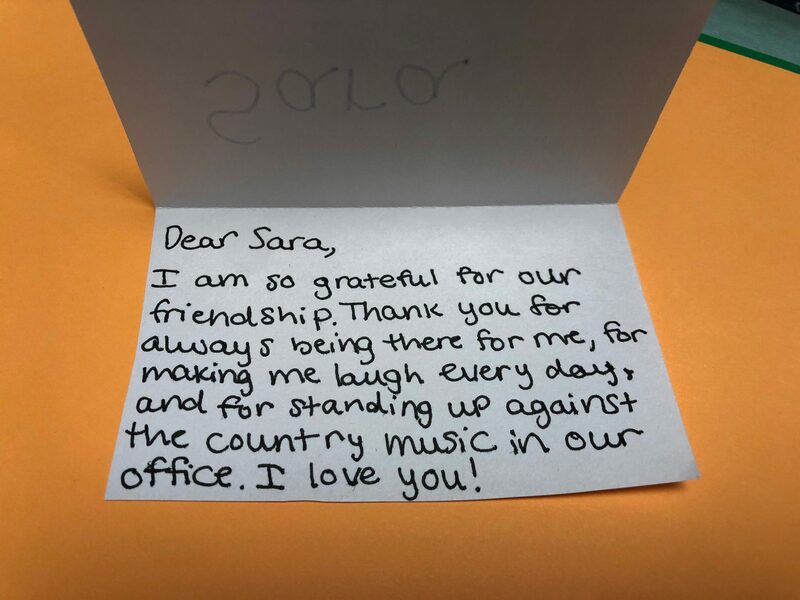 It’s a great way to set the tone for the evening and to make your participants feel valued. Inevitably, someone at my table will say, “I’m grateful for this food!” Being present while eating can deepen this gratitude. Here are some guided mindful eating exercises. In short, you’ll ask your guests to pick a bite of something but wait to eat it, first noticing its colors, textures, smells, etc. Ask them to think about where it came from; if you’re looking at a dinner roll, for example, think of all the work that went into growing and harvesting the wheat that made it. Then, take the bite, chew slowly, and notice how it tastes, notice its flavors, how it feels. Afterwards, ask your participants: Did this exercise help you feel more grateful? How can you bring this skill to your everyday life? I hope you feel full of gratitude and joy this season!